Among the hidden is one of the best books ever.There is many suspenseful moments.That you just must keep reading. The main character is Luke Garner. He is a third child and is not ment to be alive. Then he sees a face and Luke’s life gets changed for ever. You must read it now! This book is an awesome book that you NEED to put on your bucket list! This book is about a boy named Luke who is illegal because the government made a law that third children should not exist because of overpopulation. I am thinking about reading the second book of this series because it’s so GOOD! I finished Among The Hidden and it was awesome. Luke is a boy who is a third child and in this book third children are illegal. Luke has to hide from the Population Police. This book has a lot of different suspenseful scenes. So if you like tense and books that leave you hanging off a cliff then read Among the Hidden. The Book Among The Hidden is a book about Luke Garner. A boy who is a third child. The government doesn’t allow third children. Among The Hidden was a good book of the future of the United States of American. Luke garner is a illegal third child and he has to hide inside of his house. One day Luke found a way to see the outside world without being seen by people and he saw child’s face so he sneaks over and meets Jen another third child who happens to be planning a rally at DC .then she leaves for the rally without Luke because Luke didn’t want to go find out what happens next. In among the hidden. 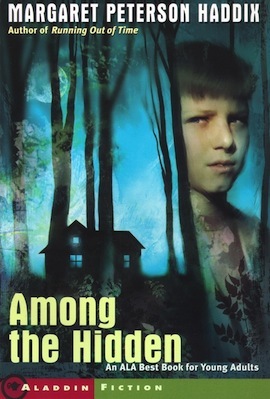 Among the hidden is about a third child named Luke who has a law against him.The law makes him hide in his attic.Next door there is another third child named Jen who makes a rally to protest the Population Law.The story fun to read because the mood is tense.I recommend this book to everyone that like dystopia books!